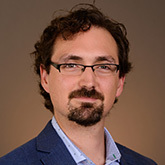 Dr. Francois Perreault joined the School of Sustainable Engineering and the Built Environment at Arizona State University as an Assistant Professor in August 2015. Before joining ASU, he was a NSERC Postdoctoral Fellow in the Department of Chemical and Environmental Engineering at Yale University. Dr. Perreault received his B.Sc in Environmental Biology (2006) from the University of Montreal. He then completed an M.Sc in Chemistry and Biochemistry (2008) and a Ph.D in Environmental Sciences (2012) in the Department of Chemistry and the Institute of Environmental Sciences of the University of Quebec in Montreal. In his work, he uses an interdisciplinary approach, combining microbiology, chemistry, and nanotechnology, to address critical issues related to water quality and water treatment. His current research focuses on the development of biofouling control strategies in engineered systems, the use of novel nanomaterials for water treatment technologies, and in understanding the fundamental interactions of nanomaterials with biological systems. Perreault, F., A. Fonseca de Faria, S. Nejati and M. Elimelech. 2014. Antimicrobial properties of graphene oxide nanosheets: Why size matters. Poster presented at the Association of Environmental Engineering & Science Professors 2015 Conference, Yale University, New Haven, Connecticut. Dewez, D. and F. Perreault. 2010. Role of the anthocyanic cell layer as a passive photoregulatory mechanism of energy dissipation in photosynthesis. Poster presented at the 13th Chemistry and Biochemistry Graduate Research Conference, Concordia University, Montreal. Perreault, F., J. Dionne and R. Popovic. 2010. Cd-induced change in the OJIP fluorescence transient activation energy. Poster presented at the 27th Eastern Regional Photosynthesis Conference, Woods Hole. Perreault, F., J. Gogot, O. Didur, P. Juneau and R. Popovic. 2010. Influence de la paroi cellulaire des algues dans la sensibilité des bioessais pour les métaux et les herbicides. Poster presented at the 78ième congrès de l’Association Canadienne Francophone pour le Savoir, Montreal. Perreault, F., C. Tardy-Laporte, C. Saison, P. Juneau, W. Gerson Matias, M. Morin, J. Claverie and R. Popovic. 2010. Core-shell copper oxyde nanoparticles toxicity in algae: Role of the algal cell wall. Poster presented at the 3rd Montreal Plant Meeting, Concordia University, Montreal. Perreault, F., D. Dewez, O. Didur, M. Vincent and R. Popovic. 2009. Investigation of cadmium toxicity in Chlamydomonas reinhardtii with and without cell wall using chlorophyll fluorescence parameters. Poster presented at the 36th Aquatic Toxicology Workshop, La Malbaie. Perreault, F., N. Ait Ali, C. Saison, R. Popovic and P. Juneau. 2008. Dichromate effect on PSII-PSI electron transport in Chlamydomonas reinhardtii. Poster presented at the 25th Eastern Regional Photosynthesis Conference, Woods Hole. Perreault, F., D. Dewez, J. Dionne, P. Juneau and R. Popovic. 2008. Alteration of photosystem II activity by cadmium effect: Activation energy related to O-J-I-P fluorescence transients. Poster presented at the 25th Eastern Regional Photosynthesis Conference, Woods Hole. Perreault, F., N. Ait Ali, C. Saison, P. Juneau and R. Popovic. 2007. Alteration of energy dissipation by dichromate in xanthophyll deficient mutants of Chlamydomonas reinhardtii. Poster presented at the 14th International Congress of Photosynthesis, Glasgow, Scotland. Perreault, F., D. Dewez, N. Ait Ali, C. Saison, P. Juneau and R. Popovic. 2007. Paramètres de fluorescence chlorophyllienne comme biomarqueur de la toxicité du Cd chez Chlamydomonas reinhardtii. Poster presented at the 23ième congrès de l’Association Canadienne sur la Qualité des Eaux, Sherbrooke. Perreault, F., A. Diallo, R. Popovic and P. Juneau. 2007. Effect of aluminium on growth and photosynthesis of Euglena gracilis and Chlamydomonas acidophila. Poster presented at the SETAC North America 28th Annual Meeting, Milwaukee, Wisconsin. Perreault, F., M. E. Tousley and M. Elimelech. 2014. Surface functionalization of thin-film composite polyamide membranes with antimicrobial graphene oxide nanosheets. Presentation at the 88th American Chemical Society Colloid & Surface Science Symposium, University of Pennsylvania, Philadelphia. Perreault, F., D. Dewez and R. Popovic. 2012. Toxicité des Nanoparticules de CuO chez le macrophyte aquatique Lemna gibba. Presentation at the 80ième congrès de l’ACFAS, Montreal. Perreault, F., A. Oukarroum and R. Popovic. 2011. Effet de l'encapsulation des nanoparticules de CuO sur sa toxicité chez Chlamydomonas reinhardtii. Presentation at the Colloque Annuel du Chapitre Saint-Laurent, Montreal. Perreault, F., A. Oukarroum and R. Popovic. 2011. Mécanismes de toxicité des nanoparticules de CuO chez Chlamydomonas reinhardtii. Presentation at the 79ième congrès de l’ACFAS, Sherbrooke. Perreault, F., C. Tardy-Laporte, W. Gerson Matias, N. Bogdan, M. Morin and R. Popovic. 2010. Interactions des nanoparticules or-dendrimères avec l’algue Chlamydomonas reinhardtii. Presentation at the 78ième congrès de l’ACFAS, Montreal. Perreault, F., C. Saison, N. Bogdan, M. Morin, J. Gogot, O. Didur, C. Tardy-Laporte, J. Claverie and R. Popovic. 2009. Investigation of nano-gold glycodendrimers interactions with algal cells and its effect on photochemical processes. Presentation at the 36th Aquatic Toxicology Workshop, La Malbaie. Perreault, F., C. Saison, P. Juneau and R. Popovic. 2008. Effet du dichromate sur l’interaction entre les photosystèmes II et I chez Chlamydomonas reinhardtii. Presentation at the XI Colloque Annuel des Étudiants-Chercheurs en Chimie et en Biochimie de l’UQAM, Montreal, Canada.